Snickerdoodles, the ultimate “comfort food cookie,” are in reality a variation of the classic sugar cookie recipe – with cinnamon. While traditional sugar cookies are rolled in granulated sugar, these are rolled in cinnamon sugar. The cookies can be soft or crisp, depending on your preference. The name’s origin is a bit of a mystery. At least four explanations vie for the truth. 2. Those of the Dutch persuasion suggest that their word snekrad, or “snicker” in English, was used to name the cookie. 4. 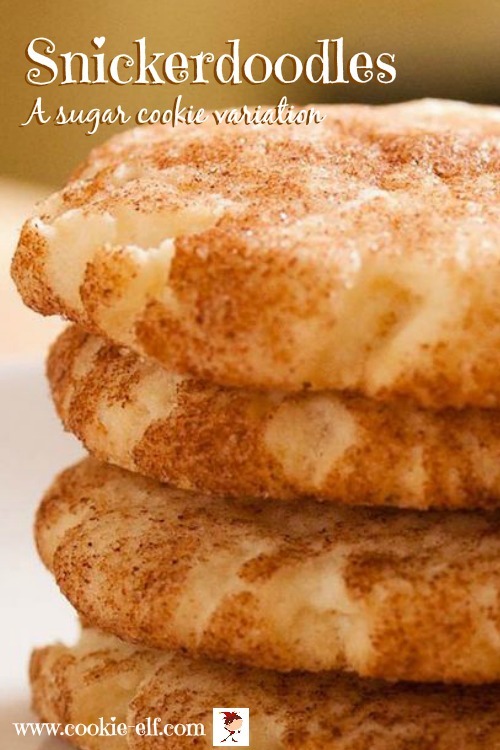 Snickerdoodle is the name of an early twentieth century American folklore hero, a champion for the underdog, and the name stuck with the cookie. Regardless of how the cookie got its name, the treats have become timeless. In a medium bowl, combine dry ingredients: flour, cream of tartar, baking soda, salt, and 2 teaspoons cinnamon. Set aside. In a separate bowl, using a mixer on medium speed, blend butter and 1 ½ cups of sugar until pale and fluffy. Add eggs and vanilla. Beat for a minute more, scraping the bowl, until the mixture is well blended. Incorporate dry ingredients into the butter mixture, a little at a time, using a low speed on the mixer, continually scraping the bowl. Remove the dough from the refrigerator. Shape the dough into 1-inch balls. Roll each ball in the cinnamon sugar mixture. Arrange balls on an ungreased cookie sheet, 2 inches apart. Bake for 8-10 minutes, until golden brown. Remove cookies from the oven and let them sit on the cookie sheet a few minutes. Transfer cookies to a cooling rack. Let cookies cool completely. Snickerdoodles can be chewy or crispy, depending on how long you bake them. For a chewier cookie, bake on the low side of the suggested time. For a crisper cookie, bake 1-2 minutes longer.